The citizenship-by-investment program of Saint Lucia is fast and straightforward: it only takes 3-4 months. You are not required to have previous managerial experience or qualifications. The application can be submitted electronically or on paper from your home country. The investment has to be made within 60 days of receiving the government’s approval. The Saint Lucia passport is of great value: you will be able to travel visa-free to 118 countries including the Schengen zone in Europe, the UK and Hong Kong. 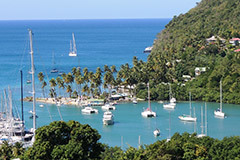 There are 3 investment options under the golden passport program of Saint Lucia. First, you can make a non-refundable donation of at least USD 100,000. Second, you can invest in a government-approved real estate project, and keep the investment for at least 5 years. The minimum real estate investment amount is USD 300,000. The third option is to invest in an Enterprise Project. For single investments, the minimum requirement is USD 3,500,000 plus the creation of at least 3 permanent jobs. In the case of joint investments, each applicant has to contribute at least USD 1,000,000 to the total investment of minimally USD 6,000,000. Under the joint option, the minimum of permanent jobs to be created is 6. For each investment option, a due diligence fee of USD 7,500 and a government processing fee of USD 2,000 is payable. In addition, a government administration fee of USD 50,000 is payable for real estate and Enterprise Project investments.